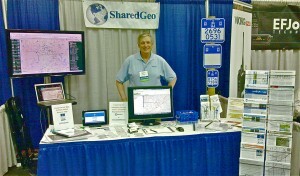 Executive Director Steve Swazee mans the SharedGeo booth. SharedGeo Executive Director, Steve Swazee, and Techincal Director, Bob Basques, were invited to attend the 2014 Minnesota Public Safety Interoperability Conference, which took place April 14-16 in St. Cloud, Minnesota. With technology’s role in public safety as the driving force behind the conference, SharedGeo fit right in, and Mr. Swazee and Mr. Basques were able to effectively showcase a variety of current projects. SharedGeo’s big draws were Mr. Basques’s Automatic Vehicle Locating system (AVL) and the US National Grid (USNG) Minnesota Marker Project. 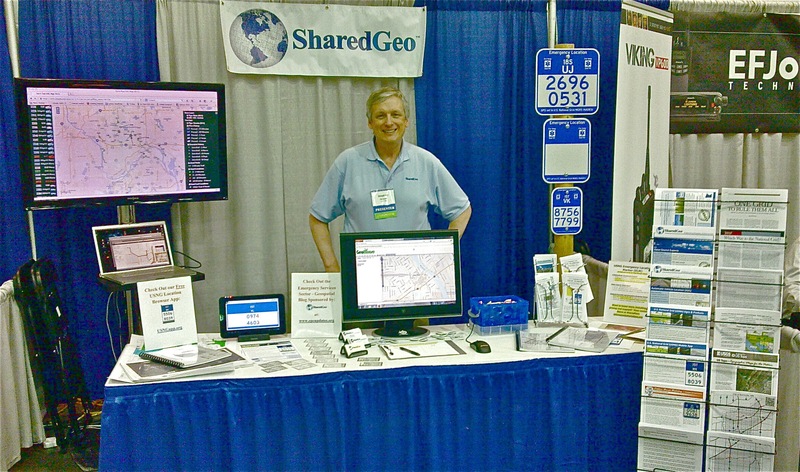 The SharedGeo booth, which experienced good traffic in the exhibitor hall, provided conference-goers with the opportunity to speak in-depth about the AVL and USNG projects with Mr. Swazee and Mr. Basques, as well as access to demonstrations and a wide selection of informational documents about SharedGeo projects. The conference itself, which boasted around 250 tech savvy attendees with mainly radio and communications backgrounds, focused primarily on First Net, the public safety broadband network developed under the guidance of the U.S. Department of Commerce, National Telecommunications and Information Administration. To learn more about the Minnesota Interoperability Conference, First Net, or SharedGeo’s AVL and USNG projects, please visit their websites. And don’t forget to check out the new USNG Information Center for the more USNG news, tutorials, and technology.